Are your Days Sales Outstanding starting to grow? Are your accounts receivables growing? Increase your collection rates by more than 20%. Virtual Accounts Receivable Outsourcing (VARO) can manage every aspect of your patient pay revenue cycle, freeing you up to manage your organization. VARO will execute patient pay strategies on behalf of the client. By leveraging high-performance collection software, we’re able to maximize the effectiveness of your inbound and outbound call campaigns and consistently deliver better collection rates than any of our competitors. VARO will manage, record, and document incoming and outgoing collections and customer service calls. VARO has the ability to generate statements as part of the revenue cycle under your organization’s name. Our system is able to send out statements at the same time—100% of the time. Every Client is individual and will sign off on each letter type. We deliver exceptional customer service to patients through highly trained callers that act as representatives of your organization’s brand. We also provide accountable reporting for management services and collections through timely, accurate reports measuring key performance indicators. 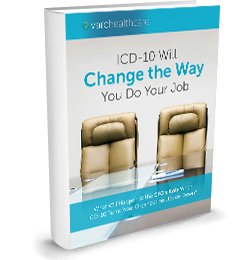 5 Ways to Prepare Yourself for ICD-10 Before Your Position Goes to Someone Else. 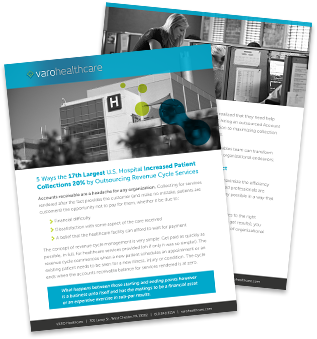 Learn how VARO increased the 17th largest U.S. hospital's patient collections by 20%.